Recently, I assembled a mixed six with a decidedly English bent. One of the bottles was the Fuller’s ESB. . Now, we had a lengthy discussion regarding aging when I came across a 2010 Fuller’s Vintage Ale and with the help of Miracle Max, we put that theory to the test with 2009 through 2011 bottles. Additionally, awhile back I had the London Porter, the London Pride and the Gale’s Prize Old Ale. So, the folks at Fuller Smith & Turner are not an unknown. The Fuller’s ESB is an Extra Special/Strong Bitter and is rated as one of the finest examples of the style by Beer Advocate. While known for the London Pride, Fuller’s is the only brewer to have had three of their beers (London Pride, ESB and Chiswick Bitter) named Champion Beer of Britain. 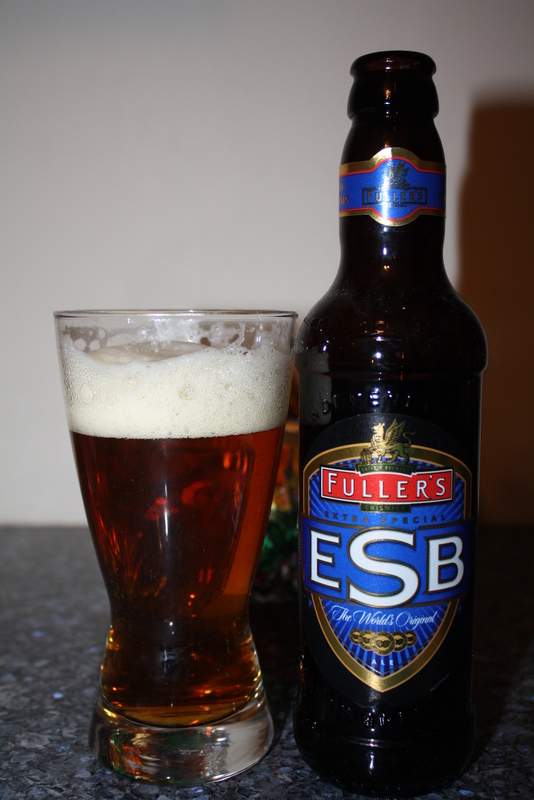 ESB was launched into the Fuller’s family in 1971, as a winter brew to replace a beer named Old Burton Extra. The potential of the beer was soon realised and ESB was installed as a permanent fixture, creating an immediate impact. Not only was it one of the strongest regularly brewed draught beers in the country (at 5.5% ABV), it was also one of the tastiest, and as the awareness of the beer grew, so did its popularity. ESB’s reputation was soon enhanced after being named CAMRA’s (Campaign for Real Ale) Beer of the Year in 1978, and the beer has not stopped winning since! With three CAMRA Beer of the Year awards, two World Champion Beer awards, and numerous other gold medals to speak of, ESB is, quite simply, the Champion Ale. Appearance: Golden amber with lots of foam and good lacing. Aroma: Sweet malt and hops. Taste: Sweet malt, a little doughy with a slightly bitter, hoppy tang finish. This was a very good beer that made a nice progression of flavor. Front to back, the tastes were spot on and I found that this was another spectacular beer in the Fuller’s line-up.